Cheese and wine, strawberries and champagne, Sonny and Cher – great things happen when you find the perfect match. Olive and rosemary is a timeless flavour combination, so when it came time to expand the Barrett’s Ridge beer bread range, this particular flavour mix immediately made the cut, so to speak. Top your Barrett’s Ridge Olive & Rosemary beer bread with olive tapenade. Not only does it taste like a Tuscan getaway, but it also adds the perfect shade of deep purple to your summer lunch table. Pour entire contents of Barrett’s Ridge Olive and Rosemary into a bowl. Oxtail stew. There’s something oh-so-satisfying about letting a crusty piece of Barret’s Ridge beer bread soak up the moreish lava of oxtail stew. It’s a match made in heaven, just like olive and rosemary. Make sure you brush your loaf with melted butter before it goes into the oven. It makes for an extra crispy crust and a crowd begging for seconds. If we said anything other than olives and feta, it just wouldn’t be right. So go ahead and pop a few pieces of feta into your next olive and rosemary beer bread. 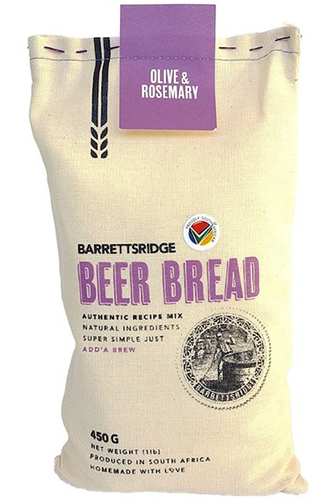 The Barrett’s Ridge bread bakers recommend pairing our Olive and Rosemary bread mix with a lager of your choice. The subtle olive flavour sits really well with the malt in the lager, while the rosemary breaks the salty combination with a nice herby edge.